We are proud to announce the release of Believe It featuring Prof, the first song off our new EP entitled The Kick Rocks Collection out May 23rd. Click the arrow on the right side of the player to download it for FREE! 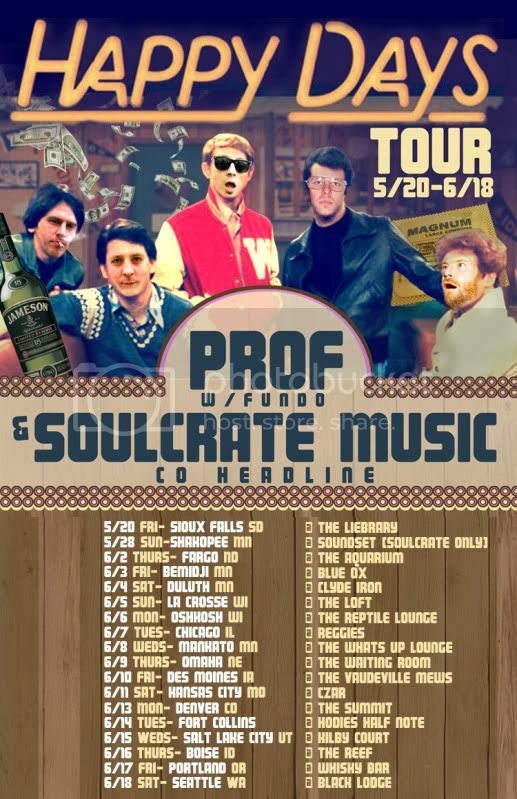 Catch us on the road this summer with Prof.
We are extremely excited to be a part of this years Soundset!!! 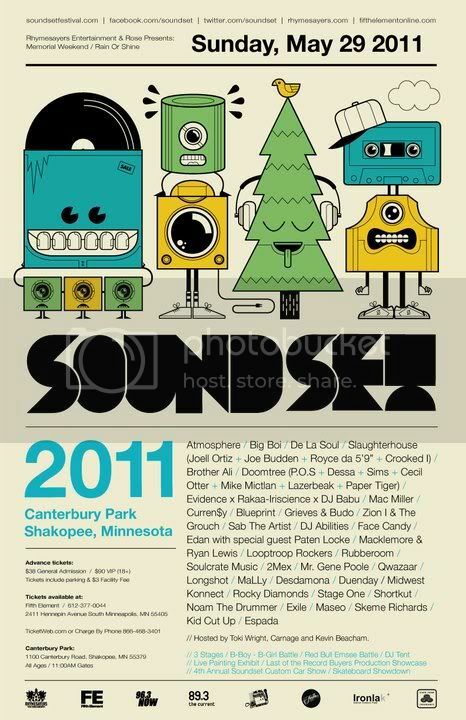 In 2010, Rhymesayers and Rose Presents produced the third year of Soundset to an outdoor festival setting at Canterbury Park in Shakopee, MN with over 18,000 people in attendance, including: two stages with over 40 artists performing, B-Boy battles, MC battle, live DJs, live artists painting, skateboard demos and a custom car show. Soundset 2011 is expected to be even bigger this year! After their sold out To All My Friends and Welcome to Minnesota tours Atmosphere returns this year to the Soundset mainstage in support of their upcoming April 12th album release The Family Sign. On the heels of his highly successful and critically acclaimed release Sir Lucious Left Foot: The Son of Chico Dusty, Big Boi, one half of superstar combo Outkast, brings his legendary live show and catalog to the Twin Cities for one of the best hip hop sets you’ll see all year. Slaughterhouse, including the full lineup of Joell Ortiz, Joe Budden, Royce da 5’9” & Crooked I perform together in Minnesota for the first time in 2 years! Referred to as “one of independent Rap’s strongest voices” by HipHopDX, Brother Ali will once again deliver his raw emotion on the main stage. Fly Society founder and Jet Life CEO Curren$y makes his Soundset debut. 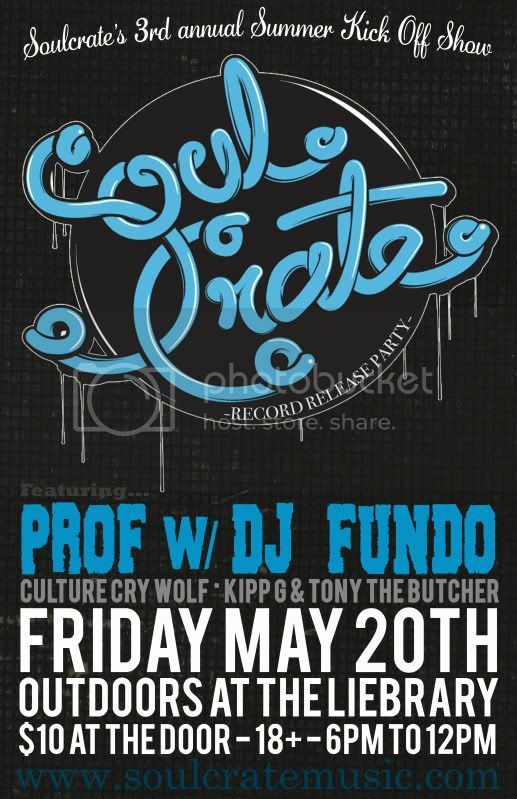 Soundset veteran Blueprint takes the stage in support of his upcoming April 5th releaseAdventures in Counter-Culture! Named one of XXL Magazine’s “2011 Freshmen”, Mac Millermakes his Minnesota debut performance at Soundset. Doomtree returns with the entire crew for their first mainstage performance. In support of his upcoming Rhymesayers debut release Cat & Dogs, Evidence teams up with Rakaa-Iriscience, hot off his new release Crown of Thorns andDJ Babu to bring you a special combined set showcasing their solo efforts while giving fans some Dilated classics as well. And this year we’re proud to announce a first ever De La SoulSoundset performance. Whether young or old this iconic hip hop group’s performance will be a favorite of the year! With options of two stages delivering over 40 artists performing nine hours of diverse music, an expanded B-Boy/B-Girl DJ tent which includes the newly added Red Bull EmSee Battle, live painting exhibit, skate demo area, Soundset custom car show and a special Last of the Record Buyers production showcase, Soundset 2011 is guaranteed to provide fun for the whole family!